Soaring auto sales are not so much a sign of a strong economy as they are an indication of financial hanky-panky. We saw this same type of fakery play out in housing between 2004 – 2006, when prices went through the roof due to a mortgage-lending scam (“subprime”) that crashed the stock market and sent the economy reeling. Now the bigtime money guys are at it again, writing up auto loans for anyone who can sit upright in a chair and scribble an “X” on the dotted line. As a result, car sales have surged to over 16 million for the last 6 months. (A full 7 million more than the low point in January, 2009.) And it’s not hard to see why either. The finance gurus are packaging these sketchy subprimes into bonds, offloading them on eager investors, and recycling the profits into more crappy loans. It’s a perfect circle and it won’t end until the loans start blowing up, jittery investors head for the exits, and Uncle Sugar rides to the rescue with more bailouts. But we’re getting ahead of ourselves. 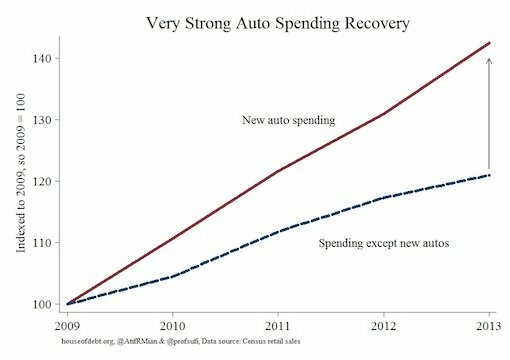 First take a look at these charts by House of Debt which shows the disparity between auto spending and other types of spending since the end of the slump in 2009. House of Debt: “New auto purchases have driven the consumer spending recovery to a large degree. The chart below shows the spending recovery for new auto sales and for all other retail spending…. From 2009 to 2013, spending on new autos increased by 40% in nominal terms. All other spending increased by only 20%. Further, excluding autos, 2013 saw lower growth in nominal retail spending than 2012….. The concern is that a lot of auto purchases are being fueled with debt, given a strong recovery in the auto loan market. 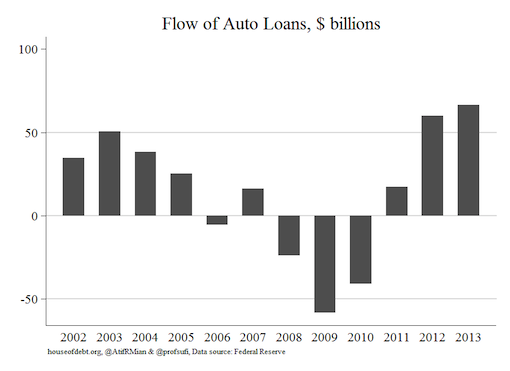 Below is the net flow of auto loans from 2002 to 2013. It is a net flow because it includes pay downs in addition to new originations. As it shows, auto lending in 2012 and 2013 tops any other year during the previous expansion from 2002 to 2007 (although it is still below the amount of new auto loans in 2000 and 2001). How about that? So there’s a bigger debt bubble in auto loans today than there was before the bust. But why? Is it because demand is strong, jobs are plentiful, wages are rising, the economy is growing, and people are optimistic about the future? ”Auto loans to people with tarnished credit have risen more than 130 percent in the five years since the immediate aftermath of the financial crisis, with roughly one in four new auto loans last year going to borrowers considered subprime — people with credit scores at or below 640. And, like subprime mortgages before the financial crisis, many subprime auto loans are bundled into complex bonds and sold as securities by banks to insurance companies, mutual funds and public pension funds — a process that creates ever-greater demand for loans. The New York Times examined more than 100 bankruptcy court cases, dozens of civil lawsuits against lenders and hundreds of loan documents and found that subprime auto loans can come with interest rates that can exceed 23 percent. The loans were typically at least twice the size of the value of the used cars purchased, including dozens of battered vehicles with mechanical defects hidden from borrowers. Such loans can thrust already vulnerable borrowers further into debt, even propelling some into bankruptcy, according to the court records, as well as interviews with borrowers and lawyers in 19 states. Can you believe that this kind of chicanery is going on in broad daylight without the regulators stepping in? Think about it for a minute: If the NYT’s journalists can find “dozens of loans that included incorrect information about borrowers’ income and employment”, then why can’t the government regulators? It’s ridiculous. What we’re talking about here is a new version of “liar’s loans” where dealers are helping people who don’t have the means to repay the debt, to fudge the details on their loan application so they can drive off in a shiny new Impala. “The average monthly new-vehicle payment was $474 in the first quarter, up 3.3 percent from a year ago. 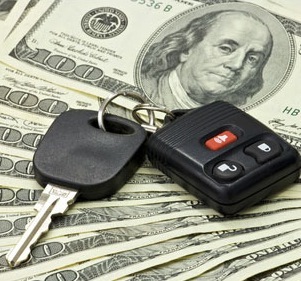 The average monthly used-vehicle payment was $352, up 1.1 percent, Experian Automotive said. So Americans are not just loading on more debt, they’re also assuming that they’re financial situation is going to be stable enough to make these large payments well into the future. Good luck with that. Let me see if I got this straight: You walk onto a car lot without a dime in your pocket, and drive off in a brand new car with everything paid for upfront? Such a deal! Can you see why we think that the sales numbers are a big fake? This isn’t the sign of a strong economy. It’s the sign of another gigantic credit bubble rip-off. But what do the dealers get out of this thing? Is it really worth their while to botch the underwriting when they know that eventually they’ll have to repossess the vehicle? Sure, it is, because there’s big money in stuffing people into loans they can’t afford. “Investors, seeking a higher return when interest rates are low, recently flocked to buy a bond issue from Prestige Financial Services of Utah. Orders to invest in the $390 million debt deal were four times greater than the amount of available securities. What is backing many of these securities? Auto loans made to people who have been in bankruptcy. An affiliate of the Larry H. Miller Group of Companies, Prestige specializes in making the loans to people in bankruptcy, packaging them into securities and then selling them to investors. HA! Now there’s a good way to feather the old retirement fund; load up on bonds made up of loans to people who’ve gone bust. Ask yourself this, dear reader: How are the ratings agencies able to give “many of these securities top ratings”, when the investigators from the Times found “dozens of loans that included incorrect information about borrowers’ income and employment, leading people who had lost their jobs, were in bankruptcy or were living on Social Security to qualify for loans that they could never afford”? Let’s face it: The regulatory changes in Dodd-Frank haven’t done a damn thing to protect the victims of these dodgy subprime schemes. Borrowers and investors are both getting gouged by a system that only protects the interests of the perpetrators. The sad fact is that nothing has changed. The system is just as corrupt as it was when Lehman went down. So, how long can this go on before the market implodes? “financial firms are beginning to see signs of strain. In the first three months of this year, banks had to write off as entirely uncollectable an average of $8,541 of each delinquent auto loan, up about 15 percent from a year earlier, according to Experian…. So, yeah, the trouble is mounting, but that doesn’t mean that this madness won’t continue for some time to come. It probably will. It’ll probably drag-on until the economy turns south and more borrowers start falling behind on their payments. That will lead to more defaults, heavier losses on auto bonds, and a hasty race to the exits by investors. Isn’t that how the subprime mortgage scam played out? So the SEC, the DOJ, and the CFPB are actually investigating the underwriting practices of these behemoth finance companies to see if they violated “civil fraud laws”? Just don’t hold your breath waiting for convictions.